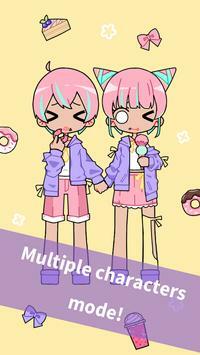 My boys and girls welcome to "Cute girl avatar maker" to start a marvelous journey. There are more things in this cute game than you have ever dream of, my dear players. Time to smuggle yourself into this virtual heaven and create the avatar of yours! ­Collect and Gacha over 100 Gifts to add to your collection! 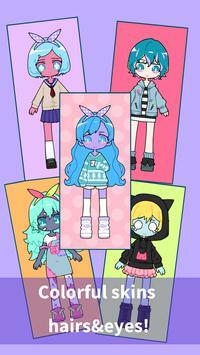 ­Dress up your own anime characters with the latest anime fashion! Mix and match hundreds of clothes hairs and more! ­Change your avatars position, size, angle easily! ­Customize your personal look! Choose your hairstyle, eyes, mouth, and more! ­Create your own scenes! Choose letters for your characters and choose from many different gestures. ­Support multiple characters to save in one image, Create portraits of you and your friends! ­Try to take a picture at any time, you can make it for your profile pics or wallpaper! ­Share your cute portrait with your friend. ­Play offline! No WiFi is needed to play! ­More features will arrive soon as we update the early access version. No matter who you are, you can always find your love in this cute games. Yep, Im talking about multiple skin colors. Does the party end in one hour? Add your friends in this cute game quickly, with our multiple characters mode, you can add as many cute girl characters as you want. Worry about space wont fit? Go ahead change everyones position, size, and angle. There are times that words arent enough to express your emotions. How about we express by our own virtual character? In Cute Avatar Maker, we provide you with facial emotions and many different gestures as your body language, hope these parts will serve you well. Still remember those good old days, gather around with your friends and talk about how beautiful the heterochromia iridium is and wish one day you could have your own? Now you got the chance, in this cute games, you can choose colors for your cute avatars eyes each by each. Black and white, red and blue, pink and yellow or any color you want. 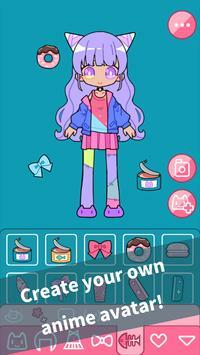 Create your own animestyled characters and dress them up in your favorite fashion outfits! Boys and girls can choose from hundreds of dresses, shirts, hairstyles, hats, and much more! After designing your characters, make them together and create any scene you can imagine in this cute games! share it with your friends! Together lets make this cute games excelsior! Please review Cute Girl Avatar Maker Cute Avatar Creator Game Game and submit your comments below. We will collect all comments in an effort to determine whether the Cute Girl Avatar Maker Cute Avatar Creator Game app is reliable, perform as expected and deliver the promised features and functionalities.